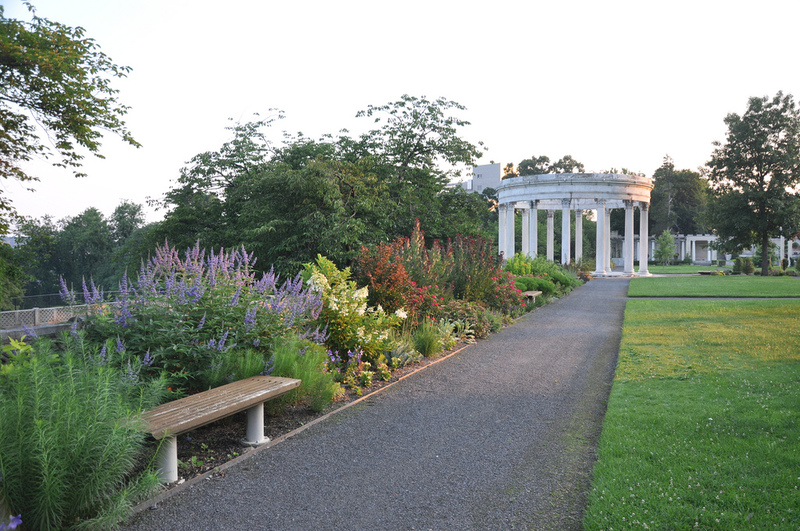 Untermyer Park and Gardens is open from 7am, and closes 45 minutes before sunset every day. The Walled Garden has limited hours. During the winter, in icy conditions, the gardens will be closed. Dogs are not allowed in the gardens with the exception of service dogs which are always welcome. Seven days a week, 7am until sunset. ​The Walled Gardens are closed on major holidays from November until the end of March: New Year's, Martin Luther King, Lincoln & Washington's birthdays, Veteran's Day, Election Day, Thanksgiving and Christmas. Please visit our tours page for information on garden tours. Information on permits may be found on the Yonkers Parks Department Website or by calling (914) 377-6450. After making arrangements to book a time for your permit, you will pick up your permit at the Yonkers Parks Department at 285 Nepperhan Ave, Yonkers, NY. Only the City of Yonkers can issue permits for this site. Untermyer Park and Gardens is owned by the City of Yonkers. There are two designated parking spaces available next to the Cola Community Center. The path leading to the Walled Garden, and the paths within the Walled Garden are flat and covered with fine gravel. The restrooms are multiuser and both have one handicapped stall. There is a small step up to enter the restrooms. Gianna’s, within walking distance at 1034 North Broadway. 914-375-0106. Zuppa, white tablecloth, 2.5 miles away in historic downtown Yonkers at 59 Main Street. 914-376-6500. Bus: Westchester's public bus system the Bee Line has stops for the 2, the 9 and the 6 lines within a block of the gardens. The Bee Line accepts cash or NYC Metrocards. Please see their system map and individual timetables (2 Line, 9 Line and 6 Line) for additional information. Train: The Greystone Metro-North station is on the Hudson line and is less than a mile away from the gardens. Please see Metro-North's travel planner for schedule and fare information. The gardens are a 20 minute uphill walk from the station: walk uphill from the station to find the stairs on the left to Warburton Avenue. Climb the stairs. Cross Warburton Avenue and go up Odell Avenue until it ends at North Broadway. Turn right on North Broadway and walk to 945 N. Broadway, which is on the right. Caution: this is a significant uphill walk of more than 200 ft in elevation. An alternate walking route to the gardens uses the Old Croton Aqueduct trail. Follow the above directions and walk up Odell on the left side of the street until just before it makes a sharp right hand turn. The Old Croton Aqueduct trail crosses Odell at this point. Turn right, crossing Odell and entering the OCA trail heading south. There is an entry point to Untermyer on the Old Croton Aqueduct trail. You will notice large stone gateposts on the east/left side of the trail and a heavy relief sculpture of a lion and a headless horse. Go through the gate and you have two options: One, turn right onto the old carriage trail. The unpaved carriage trail winds upward through the estate to the gardens and can be navigated on bicycle or on foot . Two, go up the stairs and around the ruined Gate House, up the path through the woods, up more stairs to the former Rose and Dahlia Gardens, which lead to the bottom of the Vista. Train & Bus: To avoid the uphill walk from the Greystone Train station and to shorten time spent on the bus, take the Metro-North Hudson River Line to Yonkers Train Station and catch the number 6 Bee Line bus in front of the station. Cycling and Hiking or Cross-country skiing: There is an entry point to Untermyer on the Old Croton Aqueduct trail south of its intersection with Odell Avenue. You will notice large stone gateposts on the east side of the trail and a heavy relief sculpture of a lion and a headless horse. Go through the gate and you have two options: One, turn right onto the old carriage trail. The unpaved carriage trail winds upward through the estate to the gardens and can be navigated on bicycle or on foot . Two, go up the stairs and around the ruined Gate House, up the path through the woods, up more stairs to the former Rose and Dahlia Gardens, which lead to the bottom of the Vista. Please use the Google Map in the upper right corner for driving directions. The main entrance is located at 945 North Broadway in Yonkers, just south of St. John’s Hospital. From the Saw Mill Parkway, take Exit 9/Executive Blvd., and go up the hill to North Broadway. Turn left on North Broadway, then go 1/2 mile and turn right at entrance to gardens. There is a small parking lot. When the lot is full, there is street parking.